We hold weekly classes from September through to May each year in the Skeabost Memorial Hall. You can find directions to the hall on our How To Find Us page. Thursday night: General Classes from 7.30 p.m. until 9.30 p.m. with the first part of the class being devoted to technique/practice. The last Thursday of each month will be a "social". 8 November - please note the starting time will be 7pm to allow for the AGM during the interval. Please click HERE to download the Dance Programme in Word DocX format. Please click HERE to download the Dance Programme in PDF format. Ceilidh Dancing on Friday nights from 8.00 p.m. until 10.00 p.m.
On the first Friday of every month classes will be held at Skeabost Memorial Hall. 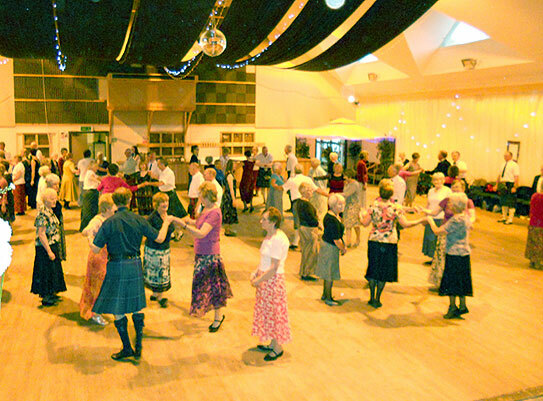 Ceilidh Dancing on Thursday nights from 8.00 p.m. until 10.00 p.m. The group normally meet Monday evenings at 8.00 p.m. in Dornie Hall.